If you are new to the Bible this website is for you ! You have entered the first door into the courtyard where we will get acquainted and find out where we may go from here. I'm known as the Old Teacher and will be your guide for most of this trip. I don't know who you are, and don't know how many of you there are. I cannot see or hear you, but you can hear me. I also don't know your background, where you come from, what religious experience you have if any, whether you're an experienced Christian, a teacher, a preacher, or maybe you have never read or looked into the Bible. Maybe you have experience in another religion but that does not matter to us. What you see, hear and experience is private, solely your own business. Maybe you're in a group in a Bible study class and have chosen to come together and study in this medium. 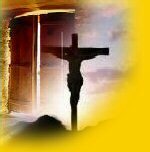 In this door , we will try to set the tone for all the other doors, with motivation to continue looking into the Scriptures. For the sake of those who might be new we will be trying to keep the next few doors fairly simple. We will be using the King James version of the Bible as we go through the doors. It's perfectly all right use any version that you want. In fact, we suggest you use the New International Version (NIV) to help your understanding along with the King James Bible. The old English of the King James Bible can be difficult to understand. You may wish to get a parallel version with both KJV and NIV side by side. The old teacher has used most versions to one extent or another, but always comes back to the King James version to establish authority. We have been asked many times why we continue to use "this old version "when so many new versions are much easier to read. There are a number of reasons for this. The King James version has been used by God to evangelize a big percentage of this earth. It also has many patterns that are apparent in the King James but not so obvious or readily discernible in most of the new versions. We think these patterns can be important clues to additional meaning that the Word of God wants us to have. The question is often asked "do you believe that the King James version is divinely inspired? "Inspiration" involves only the original revelation of the Word of God to those he has chosen to record it ,therefore, we don't believe that this version is divinely inspired . We do believe that it (the King James version), has been divinely protected in God's plan and for his purposes. Another thing we need to understand is that we have built a sub language around the Word of God and it's teachings in various churches. This is common in many fields such as medicine, law, various branches of science, computers and we could go on and on as you can well see. We find that various denominational groups have developed various schools of thought based upon their interpretation of many passages of Scripture and these various interpretations have caused disagreement and division in the body of Christ. This is the reason that we will have LITTLE DOORS with "books giving interpretations and explanations" in the various rooms as we go along. It may be a good idea to add this page to your favorites.